Plate Tectonic Control of Global Patterns of Detrital and Carbonate Sedimentation (W.M. Hay et al.). 2. Sedimentary Models of Siliciclastic Deposits and Coral Reef Interrelation (C. Santisteban, C. Taberner). 3. Histories of Coexisting Reefs and Terrigenous Sediments: the Gulf of Elat (Red Sea), Java Sea, and Neogene Basin of the Negev, Israel (G.M. Friedman). 4. Depositional Settings of Distinct Siliciclastic-Carbonate Interfaces (H.H. Roberts, S.P. Murray). 5. Terrigenous and Carbonate Sedimentation in the Great Barrier Reef Province (A.P. Belperio, D.E. Searle). 6. Mixed Siliciclastic/Carbonate Sediments of the Northern Great Barrier Reef Province, Australia (P.G. Flood, G.R. Orme). 7. Infilling of Coastal Lagoons by Terrigenous Siliciclastic and Marine Carbonate Sediment: Vieques, Puerto Rico (G.M. D'Aluisio-Guerrieri, R.A. Davis). 8. Carbonate Terrigenous Sedimentation on the North Puerto Rico Shelf (O.H. Pilkey et al.). 9. Accumulation of Mixed Carbonate and Siliciclastic Muds on the Continental Shelf of Eastern Spain (C.A. Nittrouer et al.). 10. Carbonate to Siliciclastic Periplatform Sediments: Southwest Florida (C.W. Holmes). 11. Control of Terrigenous-Carbonate Facies Transitions by Baroclinic Coastal Currents (S.P. Murray et al.). Over the years, the field of sedimentology has become subdivided into various specialities. Two of the largest groups are those who study clastic rocks and those who study carbonates. There is little communication between the two: journals appear which are exclusively devoted to one or the other, and research conferences tend to be mutually exclusive. On the other hand, rocks themselves cannot be "pigeon-holed" in this way - the facies change from clastic to carbonate both laterally and through time. This volume stems from the editors' observations of such changes in the Gulf of Mexico and their realization that these geologically important transitions were being largely ignored because of professional compartmentilization. The book opens with a chapter which gives an overview of the whole picture of global patterns of carbonate and clastic sedimentation. It then proceeds to a discussion of sedimentary models of siliciclastic deposits and coral reef relationships. The rest of the book comprises eight case studies on carbonate-clastic transitions, and a final chapter on control of carbonate-clastic sedimentation systems by baroclinic coastal currents. 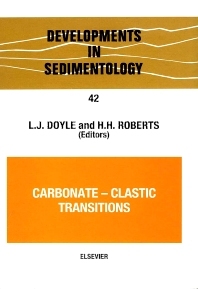 The aim of the book is to emphasize that clastic and carbonate sedimentation are not separate but part of a continuum - a transition which needs to be more thoroughly investigated and better understood. The excellent research papers presented here will undoubtedly help to achieve this goal.